It was quite an unnerving opening to a so-called “children’s movie. 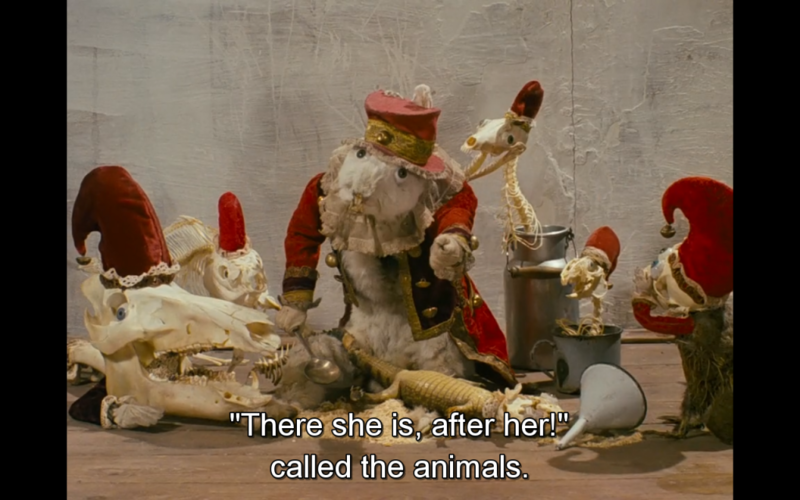 But it was never Czech director Jan Švankmajer’s intention to coddle or to coo his audience. Much like the rest of the film in question, the opening of his 1988 production Alice seeks to distance the viewer from the saccharine overtones that have become inextricably associated with Lewis Carroll’s legendary Alice’s Adventures in Wonderland. There aren’t any happy singing flowers, colorful vistas, or smiling animals in funny Victorian-era costumes. Here the White Rabbit pulls nails out of his feet before breaking out of a taxidermist’s display case. Here, bleached animal skulls with giant, unblinking eyeballs flop around and clack their teeth. Here Wonderland isn’t a fantasy, but a dream. And it’s not so much a dream as it is a fevered nightmare. 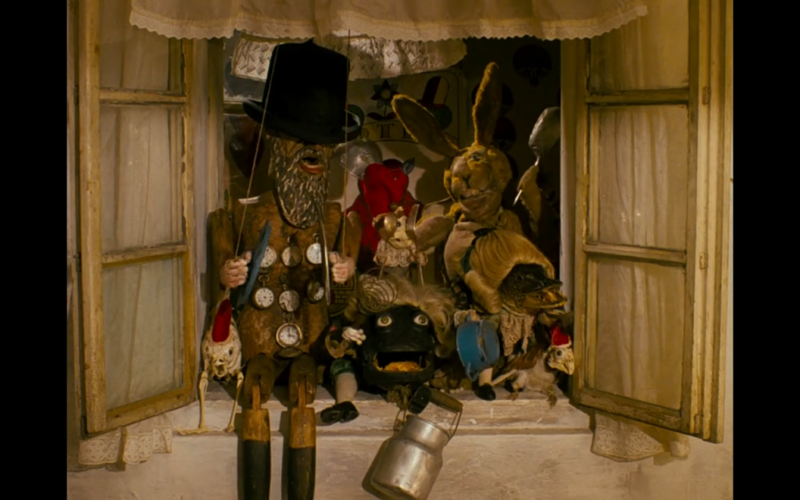 Švankmajer’s Wonderland is a Kunstkammer of odds and ends and assorted bric-a-brac. Eschewing the lush landscapes and countrysides of other adaptations of Carroll’s book, he shot the film in the choked, run-down ruins of a Prague bakery. Tiny empty rooms interconnect with strange corridors accompanied by a blatant disrespect for spatial and temporal regularity. Consider an early scene where the White Rabbit first leads Alice into Wonderland. There is a shot of the White Rabbit running in the attic, a shot of his feet crossing an odd threshold where polished wood meets jagged rock, and then a shot of him sprinting across a barren, stony desert towards a solitary writing desk. These scenes are intercut with reaction shots of Alice looking on incredulously and, even more importantly, while still in the attic. At no point does Švankmajer hint that the attic is adjacent to this desert or, for that matter, that it is connected to anything at all (or even missing a wall). And as the White Rabbit disappears into one of the writing desk’s drawers, Alice follows him, seemingly being transported thousands of miles away in a single edit. So Švankmajer’s Caterpillar is a literal sock puppet with dentures, eyeballs, and an insatiable appetite for floorboards. His Mad Matter? 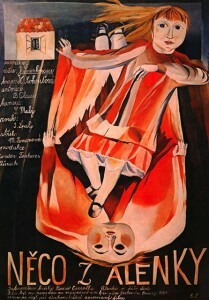 A Czech marionette. His March Hare? A wind-up stuffed doll. The King and Queen of Hearts? Figures literally cut out of playing cards. His film? A bizarre amalgam of surrealism, dream logic, and child-like fancy. 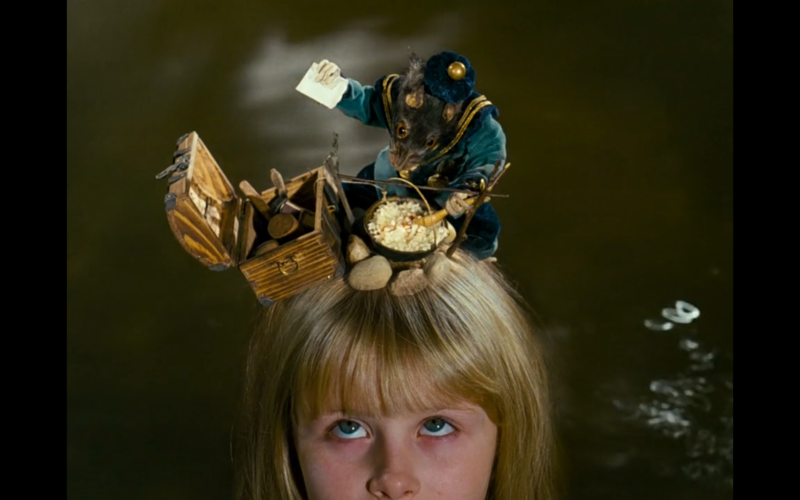 Švankmajer once complained that every other adaptation of Alice’s Adventures in Wonderland treated the story as a fairy tale when it should be treated in the same manner that Carroll first envisioned it: an “infantile dream.” And with this film for children (perhaps…) he succeeded.